Could anyone give advice or help me to fix the problem? I am a new user of code_aster. I see that you have modeled the net with bar element. Do you think the net is structurally stable in such a case? Moreover, the load applied is vertical but all the bar elements are horizontal (initially). How is it going to achieve force equilibrium? I think answering these question will lead you to the solution. I also feel modelling should be done with cables in this case. I found dbpatankar's answer very interesting so I tried to run the analysis with DYNA_NON_LINE in order to overcome instabilities and understand the problem better. I cannot figure out why the BARRE deformation is so strange, is it because of the vertical loads on horizontal elements? The deformations of the BARRE elements are huge, on the above picture I reduced the forces by 100 in order to be able to display it. I see that you have modeled the net with bar element. Sorry, I did not see the reasons why the bar elements cannot be used here. I will try to use the calbe elements to reconduct this simulation again. It seems very interesting in your results, I was also planning to use the POU_D_T elements. Maybe it can give the same results with the cable element. attached the original comm file, the modified ones and the mesh. nice! I tried to remove the gravity at the end of the simulation and it does converge. The gravity is really needed at the very beginning of the simulation, that was a good idea Jean-Pierre! Sorry, I am a little to get back this topic because of my Ph.D courses. Thank you very much for this information. It saves my time to try different elements. I think that the element's names can be different in software. I had done a similar simulation in ANSYS using beam or bar elements. I have changed the density of the material in the new .comm file to make it more realistic (see in the attachment). This material is wildly used in the fishing industry. It is a twine rope in Nylon material, and it is very flexible compared to the metal cable. Thank you for explaining why BARRE cannot be used here. But I am still a little confused that: are the motion equations of the discrete elements is different between CABLE and BARRE? From my point of view, it is may because of the nonlinear behaviour we apply in the cable (see the below code) makes it can solve this problem. Thank you very much for your contributions to this topic. Both yours and jean pierre's comm file helps me a lot to understand the simulation process. I think I got the same results as you. 5. Is the thermal dilation coefficient is necessary during the material definition? I have deleted this parameter, and the simulation can still give the same results. 6. The initial load (pre-tension, I think) is important for the simulation because it can avoid the singular matrix. But, it won't bring overestimation in the final results? 7. There only two forces on the nodes are actually applied to the simulation, I could find the reason why. because I think I have applied all the three node forces in my comm file. Useless because no thermal load. calculation into nonlinear (it is thus useless into linear). It is applied only to the first step of time. " Therefore it does'nt affect the final result, you can try to modify this value, it has no effect. The force F3 is applied to the GROUP_NO F2. Konyaro, Thank you so much! Sometimes, I could not find this kind of mistake by myself. Hello, Thank you all for your kindly help. There is one more question for this case: Can I use the DYNA_NON_LINE solver to do the same simulation? Assume the same boundary condition, it should get the same result? I have tried to modify the .comm file, but the outcome seems wrong (at least not same with the STAT_NON_LINE simulation). Could you please help me to check the .comm file? what is the difference between DYNA_NON_LINE and STAT_NON_LINE? From my point of view, the distinction between the dynamic and the static analysis on the basis of whether the applied load has enough acceleration in comparison to the structure's natural frequency. If a load is applied sufficiently slowly, the inertia forces (Newton's first law of motion) can be ignored and the analysis can be simplified as static analysis. Dynamic analysis can be used to find dynamic displacements, time history, and modal analysis. A dynamic analysis is also related to the inertia forces developed by a structure when it is excited by means of dynamic loads applied suddenly (e.g., wind blasts, explosion, water current forces). Thank you for your reply. Please forgive my knowledge gap, did you mean I need to define an initial speed or acceleration in the .comm file? or I need to define time-dependent load using AFFE_CHAR_MECA_F? Or I need to change the element? I have seen a case in the forum (a cable-coque connection case), there seems no initial definition for speed or acceleration in the .comm file. BTW, the reason why I want to use the DYAN_NON_LINE: I want to see how the net is deformed in the real-time domain. All the initial velocities and accelerations will be automatically set to zero. 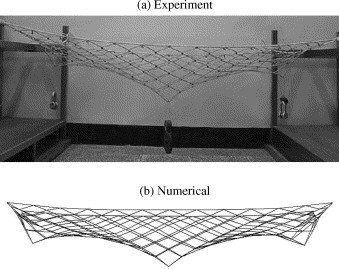 Without damping your net will be oscillating forever so it will be hard to compare the results with the static analysis. You can add damping either in the materials or use a dissipative scheme, for instance HHT with a low alpha-value, for instance -0.3. That should stabilize the net after a few oscillations. It is your kindly help makes me feel confident in this software.